^ Terminal One Group website 互联网档案馆的存檔，存档日期2012-02-24. ^ 甘迺迪國際機場擴展第四客運大樓計畫. WIDN新聞. 2010-11-24. （原始内容存档于2010-11-28）. 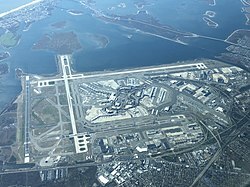 ^ JetBlue Airways Opens International Arrivals Concourse at Its Award-Winning Terminal 5 at John F. Kennedy International Airport (新闻稿). New York: JetBlue Corporate Communications. MarketWired. 2017年11月25日 [2014年11月13日]. ^ New Hawaiian – JetBlue Partnership Brings Hawaii Closer to East Coast Cities (新闻稿). Hawaiian Airlines. January 23, 2012 [July 7, 2012]. 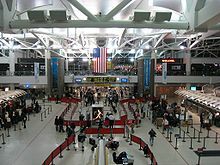 ^ JetBlue Airways Opens International Arrivals Concourse at Its Award-Winning Terminal 5 at John F. Kennedy International Airport. Marketwire. ^ TAP Portugal to introduce daily non-stops to Lisbon on new A330 aircraft from New York's JFK and Boston Logan Airports. TAP Portugal. 22 February 2016 [5 June 2016]. ^ Airspace Lounge Opens At JFK Airport's JetBlue Terminal. Huffington Post. [23 February 2015]. ^ Stats & Facts. Delta Air Lines. （原始内容存档于June 19, 2015）. ^ 1973 Results. 1973 Braniff International Annual Report. 1973: 14. ^ Belson, Ken. 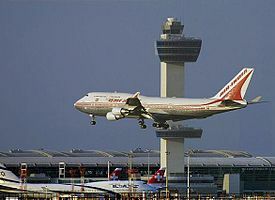 A Window That Reflected a Golden Age Comes Down at Kennedy Airport. The New York Times. February 22, 2008 [April 3, 2014]. ^ December 2013 Traffic Report (PDF). 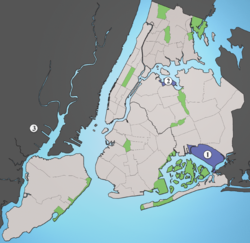 Port Authority of New York and New Jersey: 1. February 12, 2014 [February 17, 2014]. ^ Facts and Information. Port Authority of New York and New Jersey. [July 30, 2008]. （原始内容存档于July 29, 2008）. 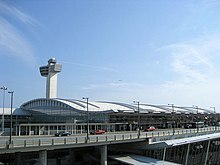 ^ New York, NY: John F. Kennedy International (JFK). Bureau of Transportation Statistics. U.S. Department of Transportation. January 2017 [May 1, 2017]. ^ Office of the Assistant Secretary for Aviation and International Affairs. U.S.-International Passenger Raw Data for Calendar Year 2016. US Department of Transportation. June 20, 2017 [August 10, 2017].